2 FREE YOGA MATS LEFT! Register For YOGA & Meditation Class! 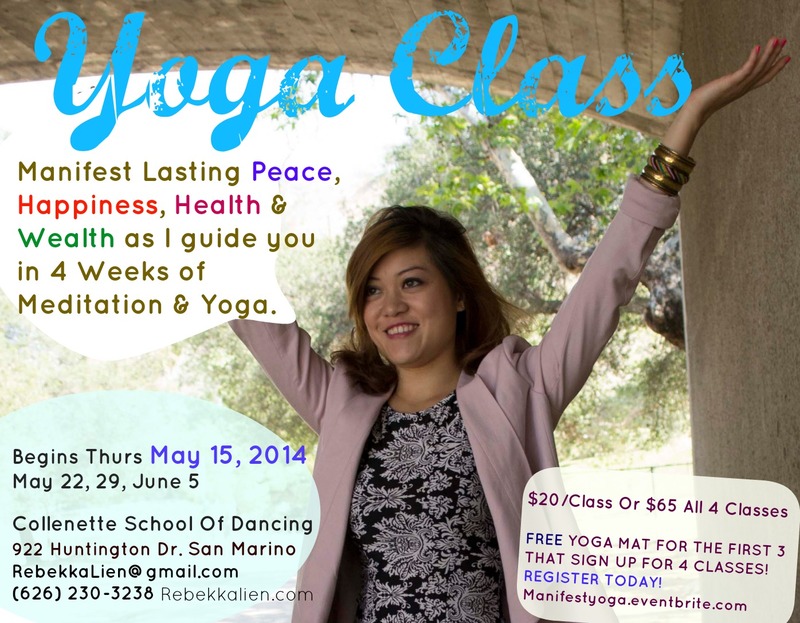 Begins Thursday May 15, 2014, every thursday ( 7pm-8pm) until June 5 located in Los Angeles! First 3 Paid SIGN UPS for all 4 weeks receive a FREE YOGA MAT! There are 2 more left!! Clarify your vision, goals, dreams, and gain a sense of peace and joy. Let go of hindrances and blockages that are keeping goodness, abundance, health and wealth from you! Get physically fit and loosen tension so you can activate your dreams in your daily life with energy! Manifest lasting Peace, Happiness, Health and Wealth As Rebekka guides you in Meditation and Yoga! This 4 week course will change your life, I guarantee it 1000%. As long as you are willing to let go, you can fill your life with goodness, happiness, and joy. With 1 Hour of Meditation and Yoga, you will manifest what will usually takes you 8 hours or a lifetime of unfocused work and striving. This has been proven for me as I quit my job 3 years ago and started manifesting success and happiness in my own life, NOT THROUGH STRIVING, but THROUGH hours of mindset changes, reflection, learning and meditation. You will also experience physical and emotional healing, I can guarantee it. Find clarity and peace as I guide you in releasing untruth (or lies) that has led to emotional and physical tension. I have been coaching and teaching more than 10 years, my life experience and journey of truth and love has compelled and driven me to teach the truths of abundance and love. The first 3 that sign up for the 4 week course will get a FREE yoga mat! Based on enrollment, there may be a manifest Party at the end! I will advise!